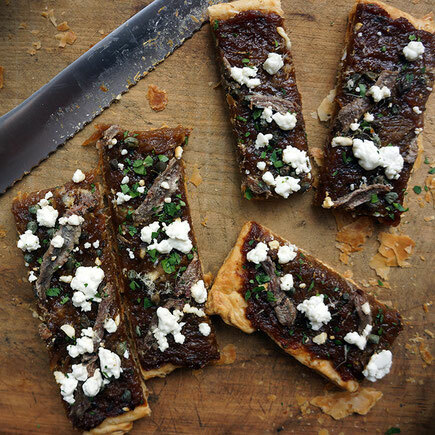 This gorgeous tart has it all—sweetness from the caramelized onions, earthiness from the goat cheese and a subtle saltiness from the anchovies. 1. Heat butter in a wide-bottomed pot over high heat. Add onions, thyme, and salt. Cook, stirring occasionally, until onions begin to brown, about 25 minutes. Reduce heat to medium; cook, stirring, until caramelized, about 40 minutes. Set aside. 2. Heat oven to 350˚. Fit pastry sheets into a parchment paper–lined 13" x 17 3/4" rimmed baking pan, pressing them against sides. Trim inside edges of pastry sheets so that they just meet in center. Prick bottom of pastry with a fork. Spread parchment paper over pastry; fill with dried beans or pie weights. Bake until edges are golden, about 25 minutes. Remove paper and beans or pie weights. Bake until bottom is golden, about 20 minutes. Let cool. 3. Spread onions over crust. Sprinkle with parmesan and capers; arrange anchovies over top. Dot with goat cheese. Bake until golden, about 30 minutes. Garnish with parsley and zest.